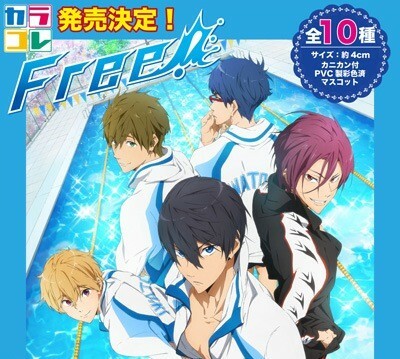 Based on the novel High Speed!, this new anime, renamed to "Free! ", is about these boys forming a swim team at their high school to compete with a former friend who went to a different school. It's so freaking funny!! I love these boys and their girlie names so much, imma sell merchandise for them ^___^ Please click on the cuts below to see the item details and pictures, and reserve if you want to!! These colorful collection mascots are scheduled for release in the Winter of 2013, not sure exactly the dates, but sometime at the end of the year!! There are two styles for each boys. One is the swimsuit version, the other is a school uniform version!! Dunno what they look like yet but I'm sure they will be awfully cute ^______^ I'm listing them for $13/piece, so make your reservations! Since they come in a set of 10, if I get more than 7 characters reserved, then I will buy a set =) I can order many sets if enough people are interested. So make a comment and I'll let you know if your place is secured!! 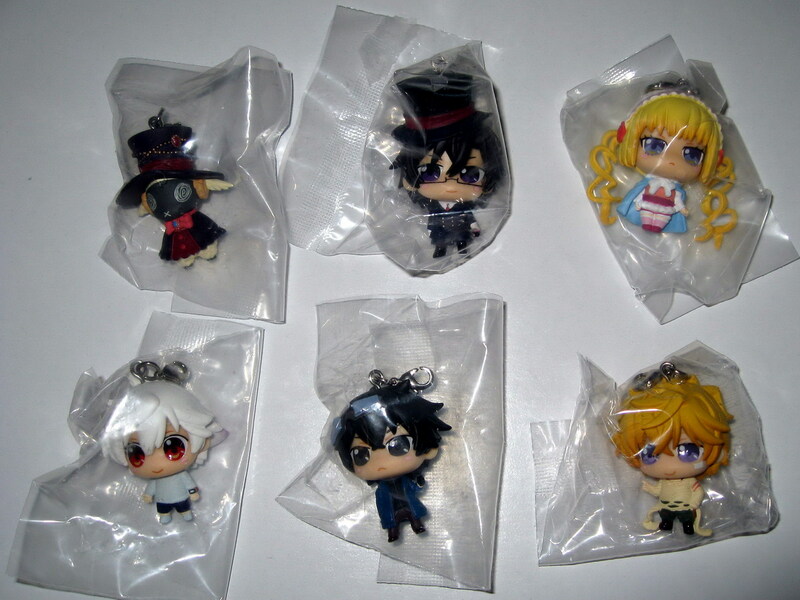 This is a super cute earphone jack rubber straps collection!! The boys are in either their school uniform or swimming suits and jackets LOL they look more chubby than fit in these SD forms!!! These are $13/piece. Schedule to be released in late September as well, so they will be available at the end of October. 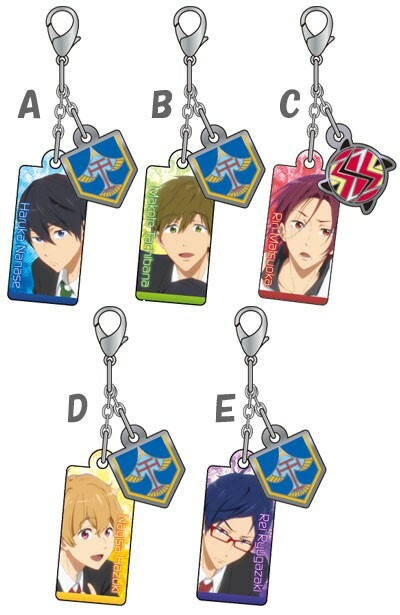 This is a set of 10, so if at least 6 are reserved then I will get a set! Make your reservations early, there's a deadline to preorder these. 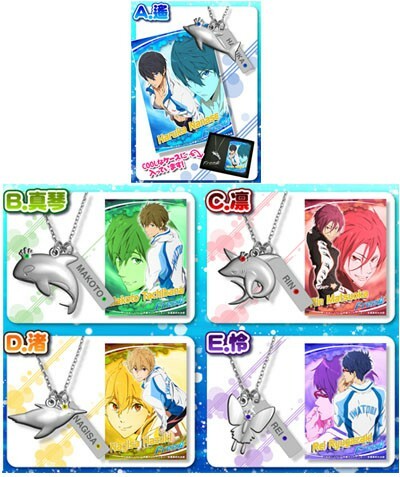 These are really nice sets of bromides with zinc alloy necklaces with a fish symbol pendant for each character, and a jewel on each of their heads ^_____^ The chain and pendant together are 55cm long, to wear around your neck. They are scheduled to be released on August 29th, but most likely they won't be coming to me until October if I do buy. These are sold individually, so I can buy as many as people request!! Since these are special item sets, they will be $30/set. Please make sure you are serious about buying if you choose to get these!! These are fastener accessories with the boys in school uniform and their school emblem. They are scheduled for release in August, so I will possibly receive in September if I get these. They are sold individually, so I can buy as requested. They will be $13 each. Let me know if you want any!! I hate you.....lmao not really. But I am interested definitely. The fasteners look great, I'd like Rei's. And Hymn mentioned being interested in Haru and Makoto's. 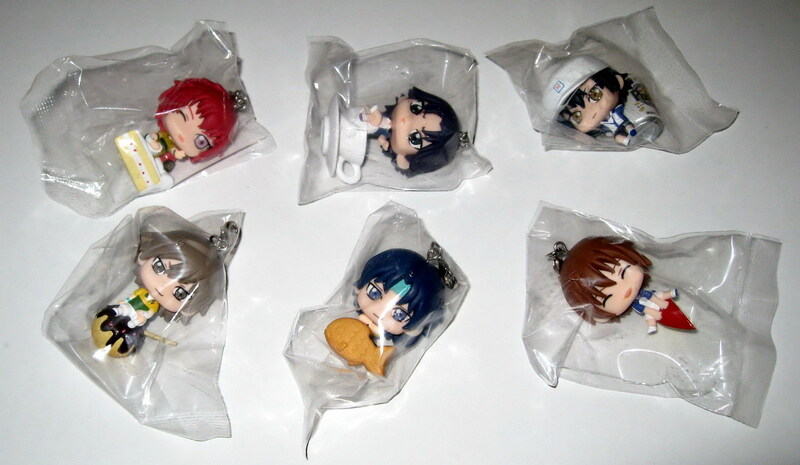 If you get a second set for those, I'd like Makoto's on that one. Ahhhh why you do this to me?! 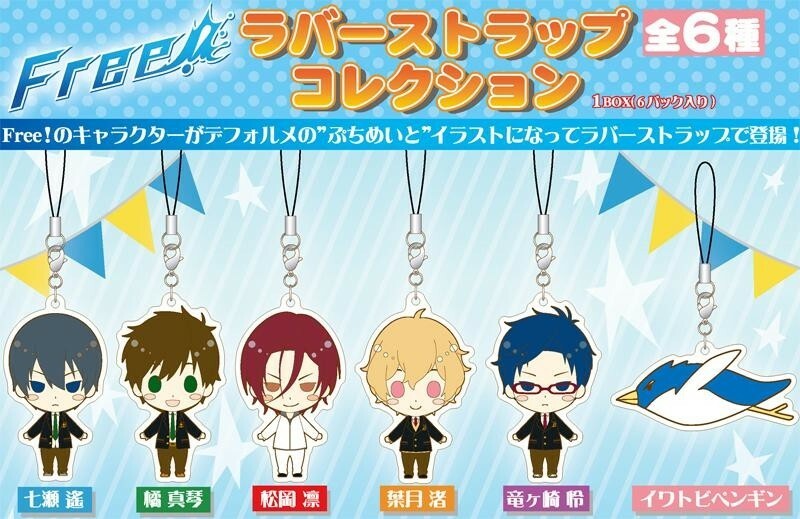 ;A; swimsuit Haruka, swimsuit Makoto, swimsuit Rin karakore please!! LOL And those fasteners are so pretty; I didn't know that they were making those. 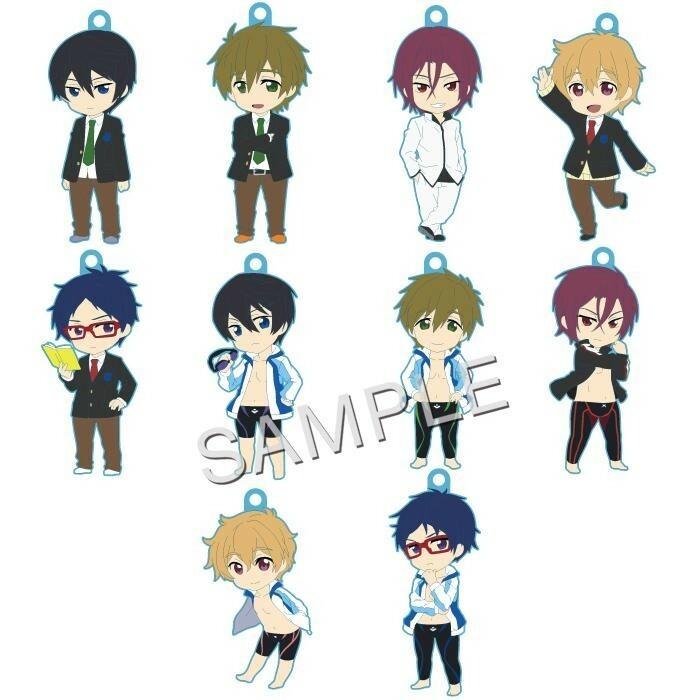 Also, for those straps with the swimsuit and uniform, doesn't it also come with an 11th one in the set with Haruka in an apron? I remember seeing it on the post on that tumblr page I'd showed you. Do you like Free! The anime? It's really funny, you should watch it! Is there still time to be put down for the reservation? I'd really like a Makoto swimsuit version. i would like the necklace of haru's if you don't mind~~^^ but may i know how big is the necklace? and is it ok if i pay for it in around 28th oct? if it comes earlier then that, maybe you could hold it for me too? >_<" Sorry for bombing you with so much questions QwQ"
Hi akidemi, you're a bit late for this time around. I've already made all the orders I want for September. I won't be ordering anything else until October. If you want to wait until October, if the dolphin pendant is still available at that time, I will buy one for you okay? Hi! :] Can you put me down for the Rin in his swimsuit karakore instead of the uniform? Please look at my sales page and see what Makoto things I have left.